PARKING: Secure car park on site charged at approx €12 per night. 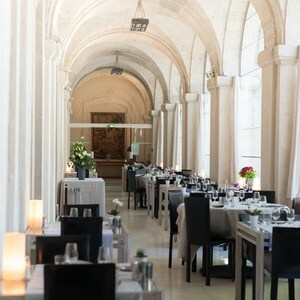 The 16th Century Cloitre Saint Louis is the ideal start to experiencing the rich history of Avignon. The accommodation is comprised of the 16th century building and a modern wing built in tribute to renowned architect Jean Nouvel. From the 300 year old trees patterning the Cloister to the restaurant nestled beneath a vaulted ceiling, this hotel takes full advantage of the stunning architecture and celebrated history from which it hails. 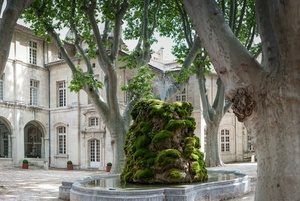 Just 5 minutes from Avignon’s most iconic monuments Palais des Papes and Pont d’Avignon, the Cloite Saint Louis is ideally located for exploring Avignon’s picturesque UNESCO listed city centre. As well as historical landmarks the city also houses fashionable boutiques and traditional French markets. Growing in notoriety is the Festival of Theatre, held annually since 1947. The event attracts over 100,000 visitors during its 3 week hold over the City, theatre lovers amongst you must be warned, this attracts a huge raise in hotel costs. Cloitre Saint Louis is also conveniently located for transport links, just 200m from the TGV station and 20 minutes from Avignon’s airport. The skilled renovation of Cloitre Saint Louis has resulted in modern facilities set against an ancient backdrop. The restaurant serves elegant French cuisine in a breathtaking location. To enjoy the views or bask or Provence’s typical hot sun there is a terrace, a solarium and an outdoor swimming pool. A charming unique feature is a chapel. The are 3 Grades of accommodation available at the Cloitre Saint Louis and all rooms are spacious and modern in decor: the Standard Room has a double bed, views over the Hotel’s private gardens and a bath or shower, A/C, flat screen satellite TV, telephone and a minibar; The superior room is a larger room with all facilities listed above; the Luxury Room has a separate lounge and bedroom, with views over the cloisters, a bath or shower, A/C, flat screen satellite TV, a telephone and a minibar.